Five hours drive northeast of Sydney, in the Liverpool Plains, is where Chinese coal firm Shenhua intends to build its next mine. If it goes ahead, this will be one of the largest coal mines in Australia. 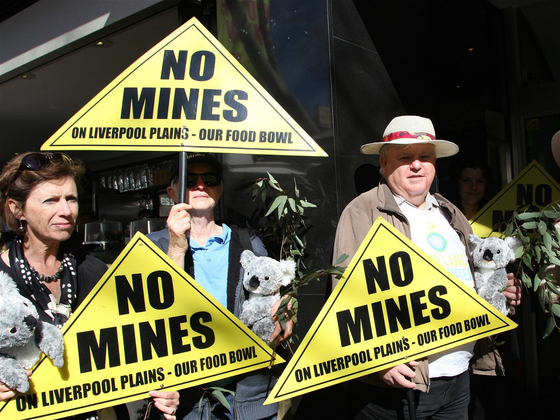 The Shenhua Watermark mine is expected to produce a staggering 290 million tonnes of coal over 30 years. There will be three working open cut pits, each several kilometres wide; and the disturbance area of the whole site is 40 square kilometres, larger than the central business districts of Sydney and Melbourne combined. Lying on prime agricultural land, the Watermark mine plan has been highly contentious as it pits Australia’s mining industry at loggerheads with farmers. 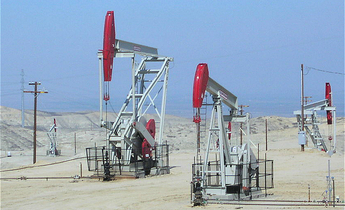 Those opposing the mine say it could affect local groundwater sources. “It has never been shown that mines can safely operate close to water resources. 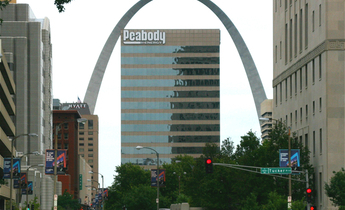 The risks to agricultural potential are too great,” says Timothy Duddy, a local landowner. Those in favour, such as Stephen Galilee of the NSW Mineral Council, point to the 425 local jobs that will be created during operation (625 during construction), and the AU$1.3 billion (6.4 billion yuan) in revenue to accrue over the lifetime of the mine. The mine has become so controversial that it may directly contribute to the downfall of one of Australia’s most senior politicians in the federal election on July 2. The site lies in the home constituency of deputy prime minister, Barnaby Joyce. When the mine was approved, Tony Windsor a former Independent MP for the area, decided to come out of retirement in order to challenge Joyce over the proposed coal mine. With only a few days remaining until the election the two candidates are polling extremely closely in a heated and hard-fought campaign. Given that China has the second largest coal reserves in the world, it is worth considering why Shenhua has been looking at mining opportunities in Australia’s agricultural heartlands at all. The answer goes back to 2008 when China’s economy experienced double-digit growth, and demand for coal was rocketing. This was the year when Shenhua was first given a licence to explore the Liverpool Plains. Although China has vast domestic coal resources, the majority are located in the northern and western provinces whilst the major coal-consuming centres are located along the eastern and southern coastline. Growth in the 2000s caused transportation bottlenecks as China’s railways and seaports struggled to keep pace, and the prospect of imported coal became increasingly attractive. Meanwhile, Australia has strong mining infrastructure, significant coal resources and a government that is determined to show China that it is open for business. Australia’s mining industry has boomed over the past 20 years, with most exports of iron ore and coal destined for China. The trend has boosted job creation and driven economic growth, yet it is not without its risks. Australia has become increasingly dependent on a single economy, with China receiving three quarters of Australian coal in 2013, for example. As the Chinese economy has slowed in recent years, the risk for Australia is that the source of its multi-decade boom becomes the cause of its bust. Figure 1: Chinese coal imports forecast. Source: Bank of America Merrill Lynch, reprinted in ‘The Australian’ March 23, 2015. In July 2015, the Chinese government decided to limit the use of imported coal in a bid to improve air quality in major cities such as Beijing and Shanghai. This has had a direct impact on the Australian coal mining sector. Tao Wang, a scholar at the Carnegie-Tsingshua Centre for Global Policy explains that “the recent trend of importing coal has largely been reversed. Chinese coal imports fell 11% in 2014, and they have fallen 37.5% again in 2015.” Mining giants Glencore and Rio Tinto slashed production due to an oversupply in the market whilst several small miners have gone into administration. 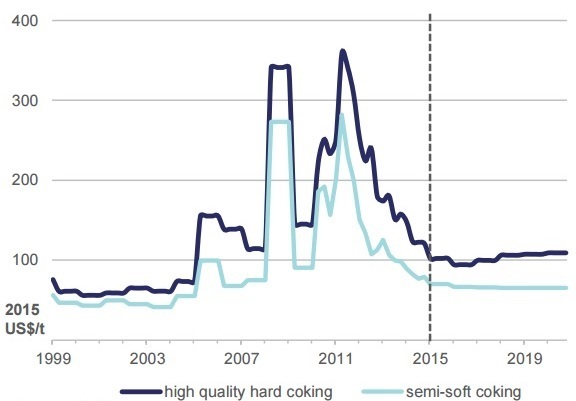 When Shenhua’s exploration licence was granted in 2008, the price of Australian coking coal was around US$300 per metric tonne (Mt). However, coal prices dropped in the following years. When the mine’s financial viability study was carried out in 2012, prices were expected to be US$142 / Mt over the lifetime of the project, and “a sustained reduction in coal price (over 55%) would be required to make the project welfare reducing". Figure 2. Australian coking coal prices. Source: Resources and Energy Quarterly, September 2015. Since then prices have continued to tumble, down to around US$85 per Mt at the time of writing, and this trend shows no signs of reversing. If Shenhua decides to excavate this year there is a clear risk that they will be left with an asset that has lost most of its former value. Tao Wang thinks “it would be a liability to Shenhua, given the poor prospect of coal consumption in China". Shenhua’s exploration licence expires in October 2016 and they have yet to apply for a full mining licence. However, it would be tricky for them to back out at this stage, given all that they have committed to the project. Shenhua's Australian chief Liu Xiang ​said: “To date, after eight years, Shenhua has spent $700 million and has little tangible progress to show for this investment." There is speculation that the Australian government will return Shenhua’s original exploration licence fees in order to allow the company to retreat with dignity. What this means for the longer term prospects of Australian coal exports is uncertain. Besides Shenhua’s mine, there are several other major coal export projects in the pipeline in the Galilee basin of northern Queensland. These projects have attracted controversy because of the impacts on climate, local environment and the risk involved in transporting the coal through narrow shipping lanes in the Great Barrier Reef. 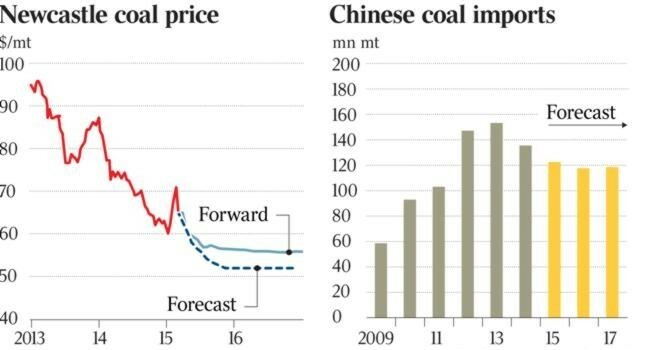 Like Shenhua’s mine, the Queensland projects have been on hold pending a recovery in coal prices. If demand remains low over the next few years it is conceivable that China’s energy transformation will leave Australia’s coal sector (and deputy prime minister) in its wake. How will Australia cope with an end to an era of booming Chinese coal imports?